This long-time poker classic shows players how to read opponents' gestures, words, expressions, and movements -- and use them to win. Mike Caro has contributed to Caro's Book of Poker Tells as an author. 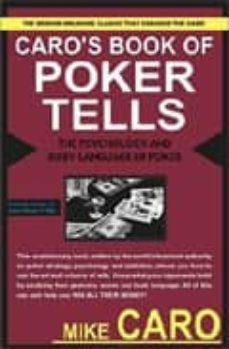 Mike Caro, the legendary "Mad Genius of Poker," is the world's foremost authority on poker strategy, psychology and statistics, and the author of many best-selling poker books including "Caro's Book of Poker Tells". He is also a leading contributor to "Doyle Brunson's Super System", the bible of poker.